The patio and garden shown in these pictures were designed and installed by Bill. 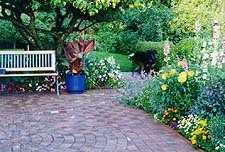 They illustrate a red paver patio installation with a circular theme (this first required removal of an aggregate patio) and complete garden renovation. 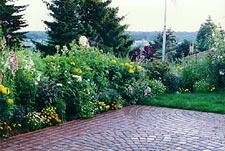 This was done in 1997 to create a perfect space and setting for the owner's intimate June wedding at home. or to make an appointment for a free estimate. All photos were taken by Bill in gardens of his own design and installation. All Contents © Copyright 2000 Living Earth.